Jain Figure of Bahubali South India, probably Karnataka 14th century Brass. WASHINGTON – Over 200 artifacts were returned to the government of India June 6, 2016, by Attorney General Loretta E. Lynch during a ceremony with Prime Minister Narendra Modi. The items were recovered as a result of an investigation conducted by U.S. Immigration and Customs Enforcement (ICE) Homeland Security Investigations (HSI) and the work of the United States Attorneys’ Offices in the Eastern and Southern Districts of New York, the Manhattan District Attorney’s Office, and the Department of Justice’s Office of International Affairs.Items returned included religious statues, bronzes and terra cotta pieces, some dating back 2,000 years, looted from some of India’s most treasured religious sites. Among the pieces returned is a statue of Saint Manikkavichavakar, a Hindu mystic and poet from the Chola period (circa 850 AD to 1250 AD) stolen from the Sivan Temple in Chennai, India, which is valued at $1.5 million. Also included in the collection is a bronze sculpture of the Hindu god Ganesh estimated to be 1,000 years old. Federal authorities marked the upcoming Asia Week in New York by seizing two allegedly looted sculptures that had been slated for auction as part of the festivities. The objects included a panel showing Revanta, a minor Hindu deity of hunting who bestows protection from the dangers of the forest and is often depicted atop a horse with a bow, and a stele of Rishabhanata, the first teacher of the ancient non-violent Jainism religion. NEW YORK— Special agents with U.S. Immigration and Customs Enforcement’s (ICE) Homeland Security Investigations (HSI) in conjunction with the Manhattan District Attorney’s Office seized two stolen Indian statues Friday, believed to be from the 8th and 10th centuries A.D., according to ICE officials. The artifacts were recovered from Christie’s auction house in New York City and are the result of an international investigation led by HSI and the Manhattan District Attorney’s Office, with assistance from the government of India and Interpol. A Buff Sandstone Stele of Rishabhanata, from Rajasthan or Madhya Pradesh, India, in the 10th century A.D, approximately 22 3/8 inches high, and depicting a stele carved with the first Jain Tirthankara (a teacher who preaches dharma) seated in vajrasana (crossed leg pose) and flanked by a pair of standing attendants, and valued at approximately $150,000. Ball State University in Indiana has handed over its lone Art of the Past artifact to federal investigators. The bronze idol — a husband and wife piece depicting Shiva the Destroyer and Parvati — had been swiped from a temple in India, and Subhash Kapoor’s Art of the Past Gallery transferred it to the university museum using a false background. Immigration and Customs Enforcement will hold on to the statue in case it needs to be used as evidence in the investigation into Kapoor’s Manhattan-based operation, which authorities allege moved $100 million worth of stolen antiquities until he was arrested in 2011 and sent to India to face charges. Shiva and Parvati will ultimately returned to India. MUNCIE, Indiana – Representatives from the David Owsley Museum of Art at Ball State University transferred Monday a religious relic known as a Festival Bronze of Shiva and Parvati to the custody of U.S. Immigration and Customs Enforcement’s (ICE) Homeland Security Investigations (HSI). Under the auspices of Operation Hidden Idols, special agents with HSI’s cultural property unit were able to determine that this idol had been looted from a temple in Southern India and brought to the United States illegally. HSI formally took custody of the artifact, which is linked to the ongoing investigation. For the past five months, officials at the museum worked hand in hand with HSI to identify the stolen piece. Long story made short: In India in the 800s, Manikkavichavakar was sent to buy 10,000 Arabian horses for the king of Pandya on the subcontinent’s southern tip. On the way, he ran into a devotee of Shiva, became enlightened and used the horse-trading money to build a temple. He wrote some hymns, got famous, became a saint, and had a bunch of statues made in his honor. More recently, a Manikkavichavakar statue got swiped from India and wound up in the U.S. and was recovered by the feds on Wednesday. NEW YORK – An anonymous collector of Asian antiquities voluntarily surrendered a stolen 11-12th century Chola bronze statue representing Saint Manikkavichavakar. Special agents with U.S. Immigration and Customs Enforcement’s Homeland Security Investigations’ cultural property unit determined the object had been looted from the Sivan Temple in Sripuranthan Village in Ariyalur District, Tamil Nadu in India. The recovery of this religious relic Wednesday follows an ongoing international smuggling probe by HSI. HSI special agents believe the collector is a victim in this situation because when the artifact was purchased in 2006, a false provenance was provided with the piece that had been manufactured to pre-date the idol’s theft. HSI special agents have tracked multiple false provenances provided by Subhash Kapoor, the owner of Art of the Past Gallery, who has been implicated in the HSI probe dubbed Operation Hidden Idol. This methodology of back-tracking an artifact to its theft site and searching out the smuggling methods from the source country to Kapoor’s U.S. gallery has led to numerous recoveries. To date, HSI special agents, in conjunction with the Manhattan District Attorney’s office, have netted in excess of 2,500 artifacts worth over $100 million. These artifacts have been sourced from countries all around the world. On Wednesday afternoon, HSI formally took custody of the stolen idol of Saint Manikkavichavakar linked to the ongoing investigation. Although the relic is a religious idol and priceless to its worshippers, it could sell for as much as $1 million if legitimately offered on the market today. In addition to recovering this idol from the Tamil Nadu temples, HSI also has recovered at least six other sacred Chola bronzes that it anticipates forfeiting and repatriating to the Government of India. HSI’s Operation Hidden Idol focuses on the activities of a former New York-based art dealer, Kapoor, who is currently in custody in India awaiting trial for allegedly looting tens of millions of dollars’ worth of rare antiquities from several nations. The trails of looted artifacts have been traced all around the world. Within the past three months, two domestic museums, the Honolulu Museum and Peabody Essex, partnered with HSI to surrender illicit cultural property stemming from Kapoor. Over the last three years, HSI special agents have executed a series of search warrants targeting Kapoor’s Manhattan gallery, along with warehouses and storage facilities linked to the dealer. Additionally, three individuals have been arrested in the United States for their role in the scheme. The estimated value of the artifacts seized so far in the case exceeds $100 million. 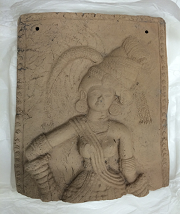 One of seven items found in a Honolulu museum believed to have been looted from India. Photo courtesy of ICE. HONOLULU — The Honolulu Museum of Art has handed over seven artifacts likely looted from India to Immigration and Customs Enforcement agents on Wednesday. ICE officials said the museum didn’t know about the objects’ background when they were acquired between 1991 and 2003. “Many of the items can be traced to one of India’s richest archeological regions, Chandraketugarh,” ICE officials said in a release on the matter earlier this week. Authorities allege some of the items are tied to the Operation Hidden Idol investigation former New York-based art dealer, Subhash Kapoor. Kapoor is currently in custody in India awaiting trial for allegedly looting millions of dollars’ worth of rare antiquities, ICE officials said. Pieces returned by the Honolulu museum include a 2,000-year-old terra cotta rattle. “In addition to the rattle resembling the Buddhist god of wealth, the objects include figurines, architectural fragments and tiles, which were removed from religious temples and ancient Buddhist sites,” officials said. In 2013, Homeland Security Investigation agents in New York linked the museum’s terra cotta rattle to the Hidden Idol case, the museum began working with authorities and identified the other six objects, officials said. The artifacts will be used in the prosecution for the Hidden Idol case, which has already lead to the seizure of more than $100 million worth of allegedly looted objects and three arrest. The items will then likely be returned to India. This “Vishnu and Parvati” sandstone sculpture dating to the 11th or 12th century was stolen from an Indian temple in 2009. U.S. Immigration and Customs Enforcement’s Homeland Security Investigations returned three recovered sculptures, valued at more than $1.5 million, to the government of India Tuesday during a repatriation ceremony at the consulate in New York City. 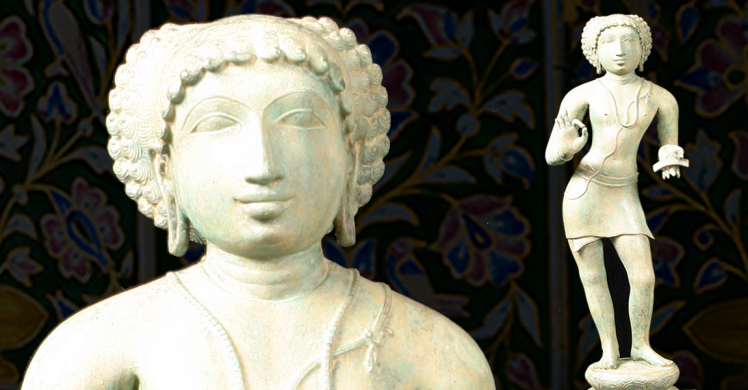 Earlier this week, statues that had been looted from India and then laundered through Hong Kong and England were returned to their home country after the wound up in the United States. One of the pieces was listed on Interpol’s most wanted list for stolen antiquities. NEW YORK —U.S. 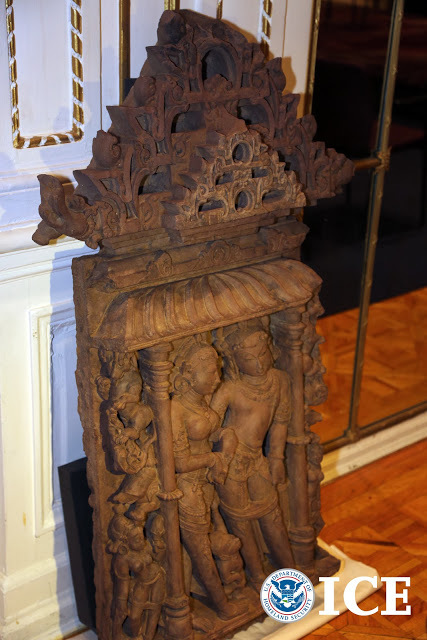 Immigration and Customs Enforcement’s Homeland Security Investigations returned three recovered sculptures, valued at more than $1.5 million, to the government of India Tuesday during a repatriation ceremony at the consulate in New York City. One of the objects –- a 350-pound sandstone sculpture stolen from an Indian temple in 2009 –- was listed as one of INTERPOL’s top 10 most wanted stolen works of art. Two of the three artifacts returned to India were reported in 2009 by the Archaeological Survey of India, who notified the Indian Consulate about two sandstone sculptures stolen from the Gadgach Temple in Atru, Rajasthan, India. The 350-pound “Vishnu and Lakshmi” sandstone sculpture dates back to the 11th or 12th century and was listed as No. 6 on INTERPOL’s top 10 most wanted works of art. Also stolen from the temple and repatriated during the Jan. 14 ceremony was the 600-pound “Vishnu and Parvati” sandstone sculpture, dating to the same period. The third artifact is a male deity black sandstone sculpture, depicting a Bodhisattva, a popular subject in Buddhist art, and is believed to date back to the 11th or early 12th century from either the Indian State of Bihar or Bengal. The investigation began April 13, 2010, when HSI New York special agents received information that the Indian sandstone sculptures recently looted from India were being offered for sale in the United States. HSI special agents discovered that the “Vishnu and Lakshmi” was transported from India to Hong Kong. From there, it was sold to a dealer in Thailand, and then resold to a buyer in London. The London buyer shipped the sculpture to New York City for an exhibition in March 2010. On April 15, 2010, HSI special agents recovered the piece while it was being shipped back to London. 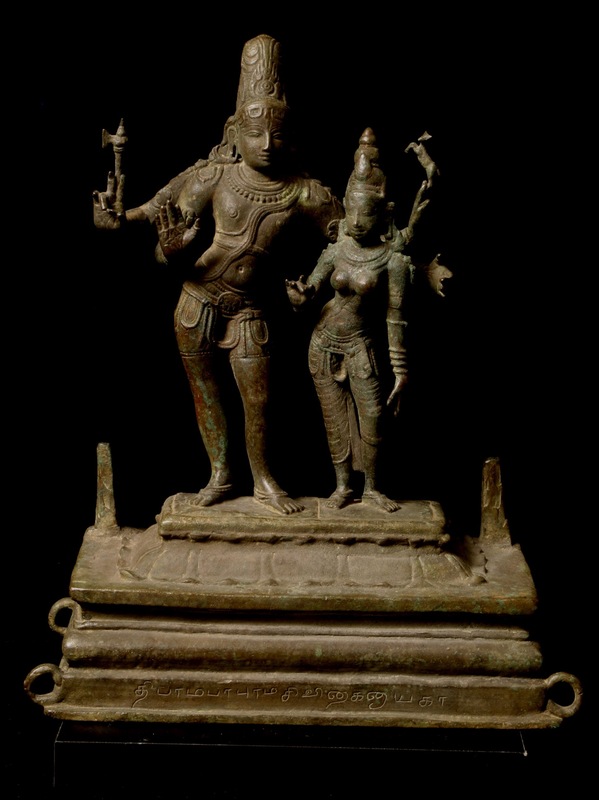 On July 12, 2010, as a direct result of the “Vishnu and Lakshmi” seizure, a sister piece, the “Vishnu and Parvati,” was seized. It was transported to Hong Kong, sold to a buyer in New York and then sold and shipped to a buyer in Basel, Switzerland. On July 7, 2011, the Indian black stone Bodhisattva figure was discovered being smuggled into the United States at Newark Airport by U.S. Customs and Border Protection officers. HSI special agents seized it after discovering that its accompanying paperwork declared Great Britain as a false country of origin. In addition, the item was grossly undervalued. The last ICE cultural property repatriation to India was in 2006 when ICE agents in NY returned a ninth century stone idol that had been stolen from a temple in Mandsaur in Madhya Pradesh in 2000. NEW YORK – A Manhattan art gallery manager pleaded guilty last week in his role in coordinating a large-scale conspiracy to sell stolen Indian antiquities worth tens of millions of dollars. Aaron Freedman, 41, of Princeton, NJ, worked for nearly two decades as a manager at Art of the Past, a gallery that served as a front for the sale of stolen and looted Buddhist and Hindu statues. As the store’s manager, Freedman pleaded guilty to one count of conspiracy in the for conspiring to possess stolen property, along with five counts of possession of stolen property. He admitted to assisting Art of the Past owner Subhash Kapoor, 64, with shipments of stolen antiquities from India, Afghanistan, Pakistan and Cambodia, as well as providing false provenances. As part of the conspiracy, Freedman assisted with the sale of stolen artwork to galleries and museums across the world, which included the sale of a stolen $5 million Shiva Nataraja statue looted from the Sivan Temple in India, which is now on display at the National Gallery of Australia and the attempted sale of a 2nd century B.C. Bharhut Stupa Yaksi pillar sculpture valued at approximately $15 million, which is now in Homeland Security Investigations custody pending forfeiture. In total, Freedman pleaded guilty to six felony counts related to possession of stolen property valued at roughly $35 million. He has also agreed to cooperate with the ongoing HSI investigation and prosecution of Kapoor, who is currently in the custody of Indian authorities for arranging the theft of statues from significant cultural and religious sites in that country. Kapoor also faces charges in New York County for possession of stolen property. NEW YORK – Special agents with U.S. Immigration and Customs Enforcement’s (ICE) Homeland Security Investigations (HSI) seized two antique statues Oct. 23 from a Manhattan hotel. These statues were seized as part of an ongoing HSI Cultural Property, Art and Antiquities Program investigation into an alleged dealer of stolen antiquities. HSI special agents executed a search warrant Oct. 23 issued for a hotel located in Manhattan. The hotel was allegedly lent these statues by Art of the Past gallery, which is owned by Subhash Kapoor. In July, an arrest warrant for Kapoor was issued by the Manhattan Criminal Court on charges he possessed stolen property. A white sandstone sculpture depicting a Ganesha from India, from the 10th century A.D. The total value of seizure is estimated at $1.7 million. 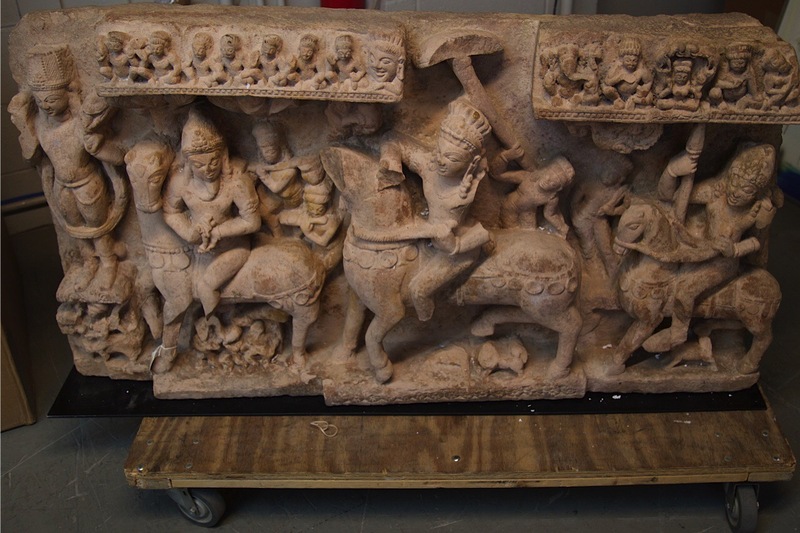 In February 2007, the Indian consulate contacted HSI requesting assistance in the investigation of the potential smuggling of Indian antiquities into New York. The Indian consulate advised HSI that an import and export company was expecting the arrival of a shipment containing seven crates manifested as “Marble Garden Table Sets.” The consulate believed these crates contained stolen Indian antiquities. This merchandise was allegedly imported by Kapoor. A second century B.C. Bharhut Stupa Yaksi pillar sculpture valued at nearly $15 million. This investigation has uncovered that Kapoor allegedly created false provenances to disguise the histories of his illicit antiquities. Investigators urge collectors and museums to further scrutinize their collections and contact HSI with any additional information. HSI will aggressively pursue the illicit pieces not yet recovered. Kapoor, who was the subject of an Interpol Red Notice, was arrested in late 2011 at Frankfurt International Airport in Germany. Kapoor was extradited to India July 2012, where he faced criminal charges.